I didn’t play Bioshock ten years ago. I played it probably around 2009, when my computer finally got a graphics card upgrade and I had enough time after high school got out to play it. 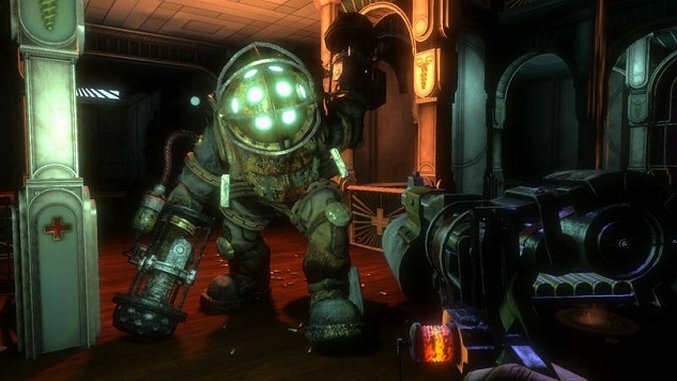 It was after its place in gaming had been cemented: I knew Bioshock was “the game,” the one that people who were smart played. The thinking man’s shooter. I thought I knew what I was getting into. I didn’t. When I played it, even two or so years late, even with “the big twist” having already been explained to me, it was an unforgettable experience. It was so good that I still use a phrase like that to describe it, even when it feels overused. There just wasn’t anything like it. Contextually, Bioshock came in the “0451” lineage, a loose term describing a design ethos shared among a number of immersive, puzzley, first person games of the early ‘90s and beyond. It’s explained very well in this video from Errant Signal if you want more of a deep dive. Essentially, Bioshock was good then because it knew where it came from, and it’s good now because we know what it did to change games since its launch. While all the games in the 0451 “genre” have similarities, it has to be Bioshock that defined the design format for the modern game. Even now, ten years later, it feels ahead of its time, bringing together narrative progression, intellectually-minded combat scenarios, and just enough of a dash of philosophy to feel fresh. While the politics of the later games became… largely a mess, to put it lightly, I still think the original had a good, simple point to make about regulation, free markets and human drive for power. I like Bioshock a lot. But I like the things Bioshock did for games possibly even more. I will steadfastly maintain that the Minerva’s Den expansion for 2010’s Bioshock 2 is actually the best Bioshock game, but even that cannot exist without being, in some way, a response to the ripples in gaming created by the original Bioshock. The focus on tone, character and narration in Bioshock bled, mutated and spilled over to other genres and games. Most of the biggest indie hits of the past few years could trace some part of their design to the templates popularized by Bioshock. It wasn’t perfect, of course. The combat, despite the plethora of options available to the player, didn’t often force improvisation, leading to “same-y” feeling encounters between the player and enemy forces. The audiolog method of story delivery wasn’t always the best, leading to the player waiting around to hear the next story beat. The politics could have been fleshed out and better defined. But even with all that, Bioshock made an impact. The world was lush and inviting. The twists and turns of the story have become gaming legends (or memes, depending on how you see it). It seemingly re-launched immersive sims into the public eye. Even now, I think fondly about Rapture, the doomed city under the sea, locked in time, felled by its own hubris. It’s a disgusting place. I visit once a year.